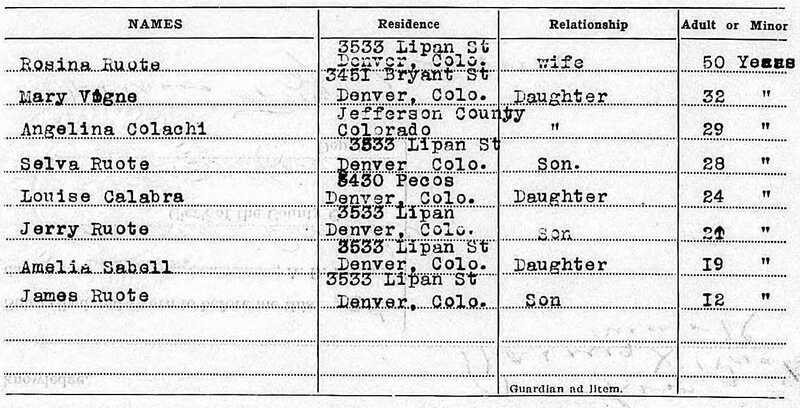 Ancestry.com's recent release of millions of U.S. probate records has been a boon for my family history research. 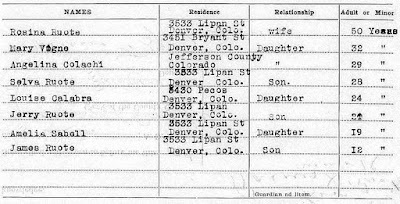 As I prepare for an upcoming trip to Italy, I wondered what the records could tell me about my Italian ancestors who settled in Colorado. I'm eager to learn as much as I can about my 2nd great-grandparents Giuseppe and Maria Rosina (La Rocca) Ruoti. I plan to spend an afternoon wandering the streets of their hometown of Potenza. Perhaps, if I can learn the locations, I'll even be able to step inside the churches where they were baptized and prayed before sailing for America in the late 19th century. 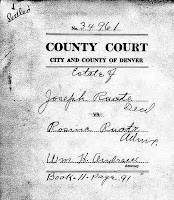 Trawling through the records, I found the probate file for Joseph Ruota who died in Denver on August 16, 1918. Joseph's probate record shines a light on his financial status in America, but also illustrates the challenges his widow was left to confront. An initial challenge I frequently run into when researching my Italian ancestors who emigrated to America is pinpointing their names. Due to Anglicization, they can be difficult to identify. Giuseppe's probate record, for example, highlights his common name discrepancies. Parts of the probate package list his surname as Ruota, but elsewhere it's spelled as Ruote or Route. 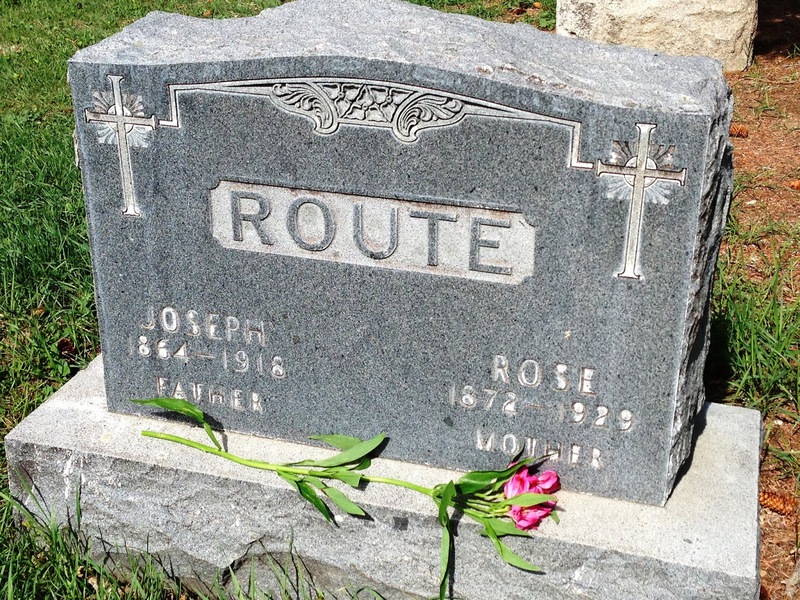 Route is the iteration that was engraved on his headstone. All are different from the Italian Ruoti with which he was born, but you can certainly see the phonetic resemblance. 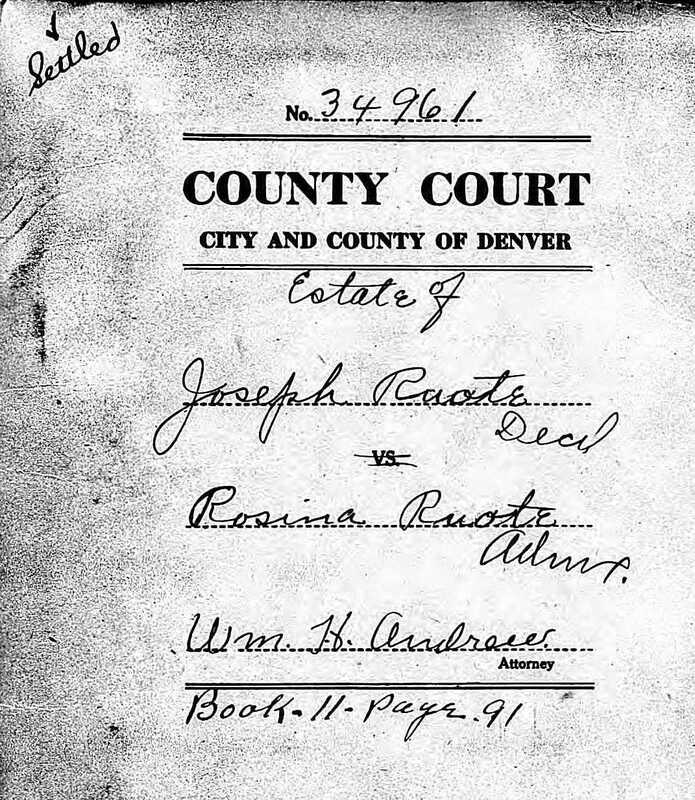 Aside from affirming the many spelling iterations of his surname, Joseph's probate record confirms his death date and that he was born in Italy. It also tells me that he was a man of modest means. At the time of his death, we learn that he had little to no cash. In fact, the records state simply that he had no estate. His net worth was locked up entirely in his home, which was valued at $2,500. Accounting for inflation, that's equivalent to approximately $42,000 in 2015. His widow, Maria Rosa Filomena (La Rocca) Route or Rosina, petitioned the court to sell the home. She desperately needed the money, so she could have financial means to provide for herself and her remaining dependents. It's heartbreaking to imagine the anguish she may have felt at the loss of her companion while also wondering how she would provide for herself and children. With a couple check marks, the 1920 census tells me that Rosina was unable to read or write. Joseph's 1918 probate record demonstrates her illiteracy in a more moving fashion. Newly widowed, Rosina had to make a mark where her signature was required on legal documents. It's one thing to see that in a census, but an entirely different experience to see the reality of it in her own hand. In the 1910 census, Joseph was listed as able to read and write. He must have taken the responsibility of signing the family's legal documents. Now, after his death, all of that responsibility was on Rosina's shoulders. Her inability to write was in the public domain. What was that experience like for her? Census records are fantastic at helping to piece together families. Of course, it can be difficult once children begin moving away or daughters marry and assume new surnames. The probate record made that effort much easier. In outlining each of his heirs, Joseph's probate record provides their addresses and married names for his daughters. As I continue to search for Ruoti, Ruota, Ruote, or Route cousins, this information provides helpful leads. 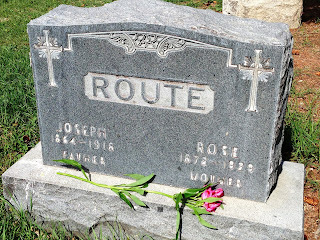 Joseph's newly digitized probate record has brought his family back to light and, in a sense, to life. 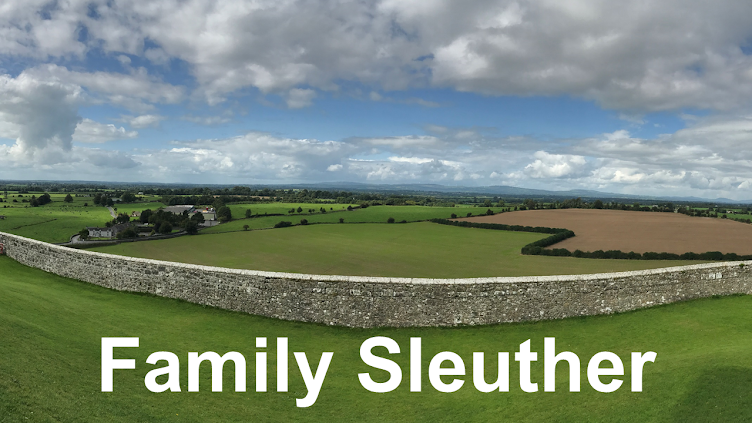 It's another example of the value these records hold for family historians, and reinforces the ever-expanding reach of genealogy as more archives open to digitization. What a wonderful find! The probate records really can be valuable. I was able to find the will of my 4th great grandmother recently. It's great that folks are having success. I hope, though, that Ancestry continues to add to the database since it's far from complete. Glad to be included, Jana. Thanks a bunch!